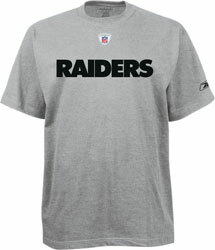 Building upon last year’s gear, Reebok is continuing to move in a Raider Take-approved direction with its 2006 designs. My preferences in Raiders gear are simple: lean, mean and true to tradition. I don’t want a bunch of crazy fonts or screaming stripes. I don’t want a clown outfit. Now that some of the 2006 designs are out, I would say that we're on the right track again after some similarly strong 2005 designs (on sale now) . The 2006 Raiders Novelty Fleece Jacket, available on July 20, does it right. Anyone would look sharp in this thing. Same goes for the new 2006 Raiders Sideline Tee , pictured here and available starting today, which keeps it real with the true RAIDERS team font across the front. The 2006 Touchdown Long Sleeve Tee, available on July 1, is simply classic, with the Raiders shield on black. I have glimpsed the future of Raiders gear, and the future is bright. I can't wait to get some new gear. I may need to get some new Jersey's first. The only player still on our roster that I have a jersey of is Moss. Woodson, Gannon, Buchannon, Kaufman, Brown, Rice and Hostetler are the others I have. I guess I got a Bo Jackson throwback last year and wear that one quite a bit. It seems we have the same taste in clothes. keep it simple. The trend towards huge writing with decorations didn't do anything for me. Thank you, Brothers in Gear! Analyzer, that's quite a jersey collection! I have one: a home Biekert jersey that has served me well. A Kaufman jersey is a great thing, love that guy. While third-round draft picks usually don't merit retail jerseys in their first year, I bet McQuistan jerseys would fly off the shelf. Roy, my sentiments exactly. While there's plenty of circus gear still out there, I'm excited that we're seeing more options that suit our tastes.